News from within and outside the area. 26th December 2017 - Chorlton WP, G. Manchester - A fresh clump of Lyophyllum decastes was seen, boy is that stem a tough one. 25th December 2017 - Poynton Pool, Stockport, Cheshire - A Christmas day wander, only just over an hour but enough time to record a few species, these being:- Auricularia auricular-judae; Schizophyllum commune; Trametes gibbosa; Bjerkandera adusta; Nectria cinnabarina; Clitocybe fragrans; Chlorophyllum rhacodes; Lepista flaccida; Lepista sordida; Dacrymyces stillatus; Stereum hirsutum; Trametes versicolor; Datronia mollis; Chondrostereum purpureum; Xylaria hypoxylon; Byssomerulius corium; Mycena galericulata; Hypholoma fasciculare; Trochila ilicina; Phacidium multivalve; Rhytisma acerinum and Xylaria carpophila. 18th December 2017 - Alexander Park, Stockport, Cheshire - Pholiota squarrosa was sen hanging on at the base of a Beech tree. 3rd December 2017 - Arley Hall, Cheshire - A call in to drop off some bird boxes, a mooch around the hall and chapel (thanks Margaret) and a quick stroll round the gardens. 1 specimen of Amanita muscaria was pushing through, I hope it beats the frosts. 2nd December 2017 - Ifton NR, Shropshire - A mooch prior to footy, a few fungi were noted, these were:- Paxillus involutus; Cystoderma amianthinum; Cuphophyllus virgineus; Lepista nuda; Vuilleminia comedens; Rhodocollybia butyracea; Mycena rosea; Stereum rameale; Diatrypella quercina; Rhopographus filicinus; Hypomyces chrysospermus; Melampsoridium betulinum; Trochila ilicina; Rhytisma acerinum; Lycoperdon pyriforme; Mycena arcangeliana; Mycena flavoalba; Mycena polydelpha; Stereum hirsutum; Schizopora paradoxa; Phragmidium violaceum; Lycoperdon perlatum and the myxo Mucilago crustacea. 20th November 2017 - Abney Hall, Stockport, Cheshire - A cycle out and the 31 fungi noted were:- Clitocybe nebularis; Typhula erythropus; Hypoxylon fragiforme; Hyphodontia sambuci; Auricularia auricula-judae; Mycena galopus; Trochila ilicina; Phloeomana speirea; Coprinellus micaceus; Xylaria hypoxylon; Ganoderma australe; Bjerkandera adusta; Armillaria mellea; Lepista nuda; Vuilleminia comedens; Rhytisma acerinum; Daedaleopsis confragosa; Chondrostereum purpureum; Heterobasidion annosum; Nectria cinnabarina; Stereum rameale; Dacrymyces stillatus; Polyporus leptocephalus; Arrhenia retiruga; Crepidotus cesatii; Crepidotus luteolus; Scutellinia crinita; Bisporella sulfurina; Ascocoryne cylichnium; Rhizomarasmius setosus and Stereum hirsutum. 19th November 2017 - Reddish Vale CP, Stockport, Cheshire - An old log had a good cluster of Coprinellus domesticus growing beneath it as well as sporting a few brackets of Bjerkandera adusta. Mycena tenerrima was at various stages and a lone specimen of Phloeomana speirea was found on a small branch. Calocera cornea; Trametes versicolor and Exidia nucleata were also examined closely. 17th November 2017 - River Mersey, Stockport, Cheshire - A 3 and 3/4 hour cycle ride and a small troop of Psathyrella comopilus was seen beneath a Beech tree and an extensive bright blue patch of Terana caerulea was noted on Gorse. 17th November 2017 - Chorlton WP, G. Manchester - A short break from the bike ride and a couple of piles of branches were checked, species seen were:- Phloeomana speirea; Mycena tenerrima; Mycena galericulata; Exidia nucleata; Lepista flaccida; Coprinellus micaceus; Trichoderma viride; Nectria cinnabarina; Echinoderma asperum; Lachnum virgineum; Hypholoma fasciculare; Hypoxylon petrinae; Stereum gausapatum; Daedaleopsis confragosa; Psathyrella conopilus; Eichleriella deglubens; Hyphodontia alutaria; Scutellinia crinita and the myxo Lycogala epidendrum. 11th November 2017 - Ainsdale Sands Lake, Lancashire - A group walk with a bunch of likeminded folk, the 38 species seen were:- Tulostoma brumale; Lepista sordida; Coleosporium tussilaginis; Taphrina alni; Rhytisma acerinum; Puccinia menthae; Crepidotus mollis; Calyptella capula; Encoelia furfuracea; Phlebia radiata; Geastrum triplex; Gloeophyllum sepiarium; Phloeomana speirea; Stereum hirsutm; Mycena tenerrima; Byssomerulius corium; Clitocybe nebularis; Xylaria hypoxylon; Arrhenia retiruga; Marasmius oreades; Clitocybe fragrans; Vuilleminia alni; Gymnopus confluens; Trochila ilicina; Hygrocybe conicoides; Gymnopus dryophilis; Cymadothea trifolii; Hygrocybe conica; Agaricus devoniensis; Inocybe sindonia; Crepidotus cesatii; Naucoria escharioides; Mycena arcangeliana; Omphalina pyxidata; Lycoperdon lividum; Phomatospora berkeleyi; Phaeohelotium nobile and the myxo Mucilago crustacea. 5th November 2017 - Consall NR, Staffordshire - I have never known a fungus season to end so abruptly, particularly considering we had had no frosts yet. Such was the case though and when all 26 folk turned up for today's walk I thought it only right to explain the situation and not promise a superabundance of species. We tootled on and in 3 hours uncovered 40 species, these were:- Russula ochroleuca; Rhodocollybia butyracea; Xylaria hypoxylon; Fomitopsis betulina; Melampsoridium betulinum; Rickenella fibula; Calocera pallido-spathulata; Bolbitius titubans; Lactarius glyciosmus; Lactarius torminosus; Suillus grevellei; Cystoderma amianthinum; Russula betularum; Scleroderma citrinum; Schizopora paradoxa; Trametes versicolor; Auricularia auricula-judae; Mycena galopus; Rhopographus filicinus; Polyporus leptocephalus; Ganoderma australe; Coprinellus disseminatus; Gloeophyllum sepiarium; Rhytisma acerinum; Coleosporium tussilaginis; Kuehneromyces mutabilis; Lepista flaccida; Daedaleopsis confragosa; Stereum gausapatum; Clavulina coralloides; Xylaria longipes; Trochila ilicina; Clitocybe geotropa; Crepidotus cesatii; Melanoleuca arcuata; Bisporella sulfurina; Marasmius setosus; Lachnum virgineum; Marasmiellus ramealis and Phlebia tremellosa. 30th October 2017 - Sale WP, G. Manchester - The young one is back home from University for a week so a walk, a mooch in a book shop and some tea and cake to finish, why not indeed. I may note of a few fungal species whilst wandering, these were:- Trametes versicolor; Bjerkandera adusta; Daedaleopsis confragosa; Xylaria hypoxylon; Lycoperdon pyriforme; Chondrostereum purpureum; Datronia mollis; Auricularia auricula-judae; Nectria cinnabarina; Hyphodontia sambuci; Stereum hirsutum; Crepidotus mollis; Agaricus arvensis; Clitocybe nebularis; Ganoderma australe; Psathyrella conopilus; Coleosporium tussilaginis; Ganoderma applanatum and Claviceps purpurea. 29th October 2017 - Bodnant Gardens, Conwy - Having led a walk for the rangers on the previous day, and two walks today, I decided to combine all sightings rather than tie myself in knots trying to cobble 3 lists together and so discombobulate the aging noggin. The 2 days were a joy, lovely staff, fine food, keen and eager attendess and a wander in some quite lovely grounds. The season had skipped on, and so it was harder work to find fungal bodies than expected but, after much huffing, puffing and enthusiasm the end list was 100 species:- Stereum rugosum; Psathyrella conopilus; Macrolepiota procera; Lacrymaria lacrymabunda; Macrocystidia cucumis; Leratiomyces ceres; Mensularia radiata; Puccinia caricina var. ribesii-pendulae; Naucoria escharoides; Inocybe erubescens; Albugo candida; Clavaria rugosa; Clavulina coralloides; Clitocybe nebularis; Armillaria mellea; Mycena galopus; Heterobasidion annosum; Rhodocollybia butyracea; Paxillus involutus; Amanita pantherina; Kretzschmaria deusta; Ganoderma applanatum; Hypoxylon fragiforme; Sparassis crispa; Pucciniastrum epilobii; Lepista flaccida; Tricholoma terreum; Melampsora euphorbiae; Inocybe geophylla var. lilacina; Tricholoma ustale; Lactarius blennius; Rickenella fibula; Clitopilus prunulus; Rhytisma acerinum; Gymnopus dryophilus; Lactarius quietus; Mycena tenerrima; Russula fellea; Hygrocybe coccinea; Cuphophyllus virgineus; Cuphophyllus pratensis; Gliophorus psittacina; Hygrocybe quieta; Bolbitius titubans; Amanita rubescens; Gymnopus peronatus; Tricholoma saponaceum; Laccaria amethystina; Vuilleminia comedens; Peniophora quercina; Clitocybe fragrans; Otidea alutacea; Pholiota squarrosa; Hypholoma fasciculare; Bjerkandera adusta; Inocybe geophylla; Auricularia auricula-judae; Coprinellus micaceus; Phaeolus schweinitzii; Xylaria hypoxylon; Chondrostereum purpureum; Stereum hirsutum; Diatrype disciformis; Leccinum scabrum; Ganoderma australe; Trametes versicolor; Calocera cornea; Phlebia tremellosa; Pleurotus ostreatus; Helvella lacunosa; Rickenella swartzii; Bulgaria inquinans; Laccaria laccata; Nectria cinnabarina; Hygrocybe reidii; Scleroderma citrinum; Puccinia violae; Tubaria furfuracea; Amanita muscaria; Amanita excelsa var. spissa; Leccinum versipelle; Russula nobilis; Lactarius glyciosmus; Trochila ilicina; Scleroderma verrucosum; Russula cyanoxantha; Trametes gibbosa; Hypomyces chrysospermus; Trichoderma viride; Agaricus xanthodermus; Echinoderma asperum; Microsphaera alphitoides; Gliophorus laetus; Cymadothea trifolii; Clavulinopsis helvola; Clavulinopsis laeticolor; Melanotus horizontalis; Hygrocybe chlorophana; Lactarius subdulcis; Hygrocybe punicea and I am adding a very old example of Calvatia gigantea to bring up the century - I think we deserve that one. 16th October 2017 - Erddig CP, Wrexham - Last years walk at this fine location produced the best list of the year. This time around we have had one of the worst hauls, you can never predict these ruddy blighters called fungi. The walk was sold out yet again, I was blessed with a patient and understanding bunch and as we stuck at it a list was built. The end count was 71 species, these were:- Puccinia glechomatis; Trochila ilicina; Cuphophyllus virgineus; Fistulina hepatica; Mycena galericulata; Microsphaera alphitoides; Armillaria gallica; Lepista flaccida; Mycena arcangeliana; Laetiporus sulphureus; Clitocybe fragrans; Entomophthora muscae; Hygrocybe quieta; Gliophorus psittacina; Cuphophyllus pratensis; Trametes versicolor; Oudemansiella mucida; Datronia mollis; Tremella aurantia; Exidia plana; Kuehneromyces mutabilis; Inonotus hispidus; Daldinia concentrica; Bjerkandera adusta; Clitocybe nebularis; Rhytisma acerinum; Xylaria hypoxylon; Clavulina coralloides; Puccinia menthae; Stereum hirsutum; Hypoxylon fragiforme; Heterobasidion annosum; Dacrymyces stillatus; Ganoderma australe; Mycena rosea; Coprinellus micaceus; Hypholoma fasciculare; Phragmidium violaceum; Lycoperdon pyriforme; Armillaria mellea; Calvatia gigantea; Flammulina velutipes; Chondrostereum purpureum; Scleroderma verrucosum; Vuilleminia comedens; Auricularia auricula-judae; Nectria cinnabarina; Clitocybe geotropa; Phacidium multivalve; Puccinia aegopodii; Hygrocybe coccinea; Trametes gibbosa; Puccinia caricina var. ribesii-pendulae; Pleurotus ostreatus; Chlorophyllum rhacodes; Marasmius oreades; Amanita rubescens; Rhodocollybia butyracea; Russula ochroleuca; Pholiota squarrosa; Hyphodontia sambuci; Ganoderma applanatum; Crepidotus mollis; Mensularia radiata; Kretzschmaria deusta; Ampulloclitocybe clavipes; Scutellinia crinita; Hygrocybe chlorophana; Uromyces viciae-fabae; Bisporella citrina and Peniophora quercina. 21st October 2017 - Mere Sands Wood, Lancashire - Sold out yet again, the weather cracked at the back end and kicked up a twister but we carried on and despite no swathe of specimens we manage to clock up 94 species, these were, in reverse order:- Lepista sordida; Lycoperdon perlatum; Lepista flaccida; Phacidium multivalve; Volvariella surrecta; Puccinia caricina var. ribesii-pendulae; Hormotheca robertiani; Hyphodontia sambuci; Fomes fomentarius; Geastrum triplex; Laccaria amethystina; Phlebia tremellosa; Roridomyces roridus; Sphaeropsis sapinea; Heterobasidion annosum; Trichaptum abietinum; Gymnopilus penetrans; Melanophyllum haematospermum; Pucciniastrum epilobii; Albugo candida; Coprinellus micaceus; Trochila ilicina; Pucciniastrum circaea; Skeletocutis amorpha; Lepista nuda; Baeospora myosura; Mycena galopus; Bjerkandera adusta; Rhytisma acerinum; Leccinum scabrum; Tremella foliacea; Russula ochroleuca; Pleurotus ostreatus; Rhodocollybia butyracea; Boletus edulis; Amanita muscaria; Phallus impudicus; Stereum rugosum; Rhopographus filicinus; Datronia mollis; Tricholoma fulvum; Taphrina betulina; Exidia thurietiana; Auricularia auricula-judae; Exidia nucleata; Exidia glandulosa; Xylaria carpophila; Melanotus horizontalis; Hypoxylon fragiforme; Pluteus cervinus; Schizopora paradoxa; Russula fellea; Nectria cinnabarina; Erysiphe heraclei; Lyophyllum decastes; Polyporus tuberaster; Lactarius quietus; Melampsoridium betulinum; Schizophyllum commune; Chondrostereum purpureum; Daedaleopsis confragosa; Laccaria laccata; Scleroderma citrinum; Ganoderma australe; Microsphaera alphitoides; Tubaria furfuracea; Hygrocybe reidii; Xylaria hypoxylon; Taphrina tosquinetii; Hygrocybe nigrescens; Dacrymyces stillatus; Mycena galericulata; Peniophora quercina; Daldinia concentrica; Calocera cornea; Trametes versicolor; Trametes gibbosa; Fomitopsis betulina; Hypholoma fasciculare; Vuilleminia comedens; Annulohypoxylon multiforme; Stereum hirsutum; Mycena speirea; Mycena tenerrima; Bisporella sulfurina; Postia subcaesia; Crepidotus cesatii; Tremella aurantia; Ascocoryne cylichnium; Ascocoryne sarcoides; Phyllactinia guttata; Inocybe sindonia; Clitocybe phyllophila and Clitocybe nebularis. 15th October 2017 - Tatton Park, Cheshire - And all sold out again and 26 peeps in tow sharing the wonder of the fungal world. A slow stroll with a break for lunch and the count of species was a respectable 111. The list was comprised of:- Mycena sanguinolentum; Gymnopus peronatus; Postia ptychogaster; Dermoloma cuneifolium; Cuphophyllus virgineus; Nectria cinnabarina; Mycena aetites; Phaeolus schweinitzii; Gymnopus confluens; Suillus grevellei; Gliophorus irrigatus; Gymnopilus junonius; Coprinellus micaceus; Pleurotus ostreatus; Psilocybe semilanceata; Sphaeropsis sapinea; Gymnopilus penetrans; Tricholomopsis rutilans; Hygrocybe nigrescens; Stropharia inuncta; Cystoderma amianthinum; Cuphophyllus pratensis; Annulohypoxylon multiforme; Fomitopsis betulina; Xylaria longipes; Pluteus umbrosus; Pluteus cervinus; Mycena pura; Russula nigricans; Lactarius blennius; Russula ochroleuca; Trametes gibbosa; Russula fellea; Auricularia auricula-judae; Lepista flaccida; Laccaria amethystina; Neoboletus luridiformis; Lactarius quietus; Boletus edulis; Amanita muscaria; Claviceps purpureum; Heterobasidion annosum; Lycoperdon perlatum; Trichaptum abietinum; Cordyceps militaris; Imleria badia; Clitocybe odora; Rhopographus filicinus; Amanita rubescens; Daedaleopsis confragosa; Mycena galericulata; Armillaria gallica; Psathyrella piluliformis; Calocera viscosa; Rickenella swartzii; Rickenella fibula; Laccaria laccata; Macrolepiota procera; Torula herbarum; Schizopora paradoxa; Scleroderma citrinum; Phlebia tremellosa; Spinellus fusiger; Mycena polygramma; Calocera cornea; Bjerkandera adusta; Bolbitius titubans; Clitocybe nebularis; Kretzschmaria deusta; Meripilus giganteus; Oudemansiella mucida; Ganoderma australe; Rhodocollybia butyracea; Mycena galopus; Armillaria ostoyae; Hypholoma fasciculare; Erysiphe urticae; Mycena inclinata; Lepista nuda; Hypoxylon fragiforme; Stereum hirsutum; Rutstroemia firma; Pucciniastrum epilobii; Datronia mollis; Trochila ilicina; Phacidium multivalve; Xylaria hypoxylon; Trametes versicolor; Coprinopsis atramentaria; Coprinus comatus; Rhytisma acerinum; Trichoderma viride; Phragmidium violaceum; Leptosphaeria doliolum; Clavulinopsis helvola; Clavaria fragilis; Pluteus chrysophaeus; Ascocoryne sarcoides; Clavulinopsis laeticolor; Phlebiella sulphurea; Hygrocybe quieta; Coprinellus domesticus; Hymenoscyphus herbarum; Scutellinia crinita; Hygrocybe chlorophana; Hygrocybe coccinea; Inocybe napipes; Lactarius subdulcis; Entoloma jubatum and the myxos Mucilago crustacea and Lycogala epidendrum. 14th October 2017 - Formby NT, Lancashire - Another walk sold out, 26 peeps in tow on a 3 hour jaunt and 67 species the list to date:- Hygrocybe colemanniana; Rutstroemia luteovirescens; Melanoleuca arcuata; Geoglossum cookieanum; Mycena aetites; Trametes gibbosa; Stereum hirsutum; Lactarius torminosus; Otidia bufonia; Humaria hemisphaerica; Leccinum scabrum; Coprinellus micaceus; Marasmius oreades; Lepista nuda; Helvella lacunosa; Mycena acicula; Hygrocybe conicoides; Bolbitius titubans; Bovista plumbea; Chondrostereum purpureum; Tricholoma terreum; Mycena pura; Lactarius deterrimus; Xylaria polymorpha; Sphaeropsis sapinea; Trichaptum abietinum; Tapinella panuoides; Ischnoderma benzoinum; Trametes versicolor; Xylaria longipes; Stereum rugosum; Hypholoma fasciculare; Crepidotus mollis; Armillaria gallica; Clitocybe nebularis; Annulohypoxylon multiforme; Gymnopilus penetrans; Schizophyllum amplum; Otidea onotica; Agaricus sylvaticus; Byssomerulius corium; Auricularia auricula-judae; Hyphodontia sambuci; Pucciniastrum epilobii; Rhodocollybia butyracea; Lepista flaccida; Lactarius aurantiacus; Armillaria mellea; Bjerkandera adusta; Hypoxylon petrinae; Xylaria hypoxylon; Inocybe geophylla; Fomitopsis betulina; Microsphaera alphitoides; Geastrum triplex; Geastrum fimbriatum; Lepiota cristata; Erysiphe urticae; Heterobasidion annosum; Lycoperdon perlatum; Russula sanguinaria; Inocybe geophylla var lilacina; Coprinus comatus; Rhytisma acerinum; Macrolepiota mastoidea; Pluteus atromarginatus and the myxo Lycogala epidendrum. 11th October 2017 - Fletcher Moss, G. Manchester - Taking a quick liquid break I noticed some nearby Cherry Trees had several clumps of Pholiota squarrosa growing around their bases. What a lovely fungus this is, quite beautiful in fact, but aren't they all, in their own special way! 11th October 2017 - West Didsbury, G. Manchester - Cutting through a few backs roads on my way home I pulled up the bike mighty quick when I spied, what turned out to be, 47 specimens of Amanita muscaria beneath a tired looking Beech tree. What a nice sight it was. Also in residence were a few specimens of Clitocybe geotropa. 11th October 2017 - Chorlton WP, G. Manchester - Hygrocybe nigrescens; Cuphophyllus virgineus; Schizopora paradoxa; Trametes versicolor and Daedaleopsis confragosa were the only fungi noted whilst cycling around the main pond. 8th October 2017 - Arley Hall, Cheshire - 2 walks, 59 people, never easy to deal with but I tried my best and pootled along striving to keep all entertained. A round of applause after one walk, many thanks throughout the day, the lists, when combined produced a total of 116 species:- Laccaria laccata; Russula amoenolens; Xerocomellus cisalpinus; Rickenella fibula; Lycoperdon pyriforme; Lepiota cristata; Rhytisma acerinum; Microsphaera alphitoides; Amanita rubescens; Gliophorus laetus; Cystoderma amianthinum; Trametes versicolor; Xylaria hypoxylon; Gliophorus psittacina; Clitocybe nebularis; Trochila ilicina; Phacidium multivalve; Bolbitius titubans; Gliophorus irrigatus; Dermoloma cuneifolium; Inocybe geophylla var. lilacina; Grifola frondosa; Albugo candida; Agaricus xanthoderma; Geastrum triplex; Lycoperdon perlatum; Nectria cinnabarina; Hyphodontia sambuci; Schizopora paradoxa; Mycena galopus; Armillaria mellea; Entoloma rhodopolium; Amanita muscaria; Phallus impudicus; Lactarius glyciosmus; Lactarius turpis; Lactarius tabidus; Chalciporus piperatus; Clitopilus prunulus; Clavulina corraloides; Hypholoma fasciculare; Rickenella swartzii; Gymnopus dryophilus; Rhodocollybia butyracea; Coprinus comatus; Inocybe geophylla; Coprinellus micaceus; Clavulina rugosa; Peniophora quercina; Amanita fulva; Laetiporus sulphureus; Stereum hirsutum; Vuileminia comedens; Leccinum scabrum; Cuphophyllus pratensis; Russula ochroleuca; Paxillus involutus; Tricholoma fulvum; Boletus edulis; Russula betularum; Pholiota squarrosa; Melampsora euphorbiae; Cuphophyllus virgineus; Hygrocybe nigrescens; Byssomerulius corium; Chaetosphaerella phaeostroma; Auricularia auricula-judae; Exidia nucleata; Trichoderma viride; Mycena inclinata; Stereum gausapatum; Coprinopsis atramentaria; Xylaria longipes; Tubaria furfuracea; Fistulina hepatica; Mycena galericulata; Pleurotus ostreatus; Xerula radicata; Schizophyllum commune; Scleroderma citrinum; Lactarius blennius; Taphrina betulina; Collybia cookei; Lepista flaccida; Daldinia concentrica; Trichaptum abietinum; Bjerkandera adusta; Trametes gibbosa; Gymnopus confluens; Chlorophyllum rhacodes; Lepista nuda; Ganoderma australe; Mycena pura; Puccinastrum epilobii; Laccaria amethystina; Fomitopsis betulinus; Russula atropurpurea; Lacrymaria lacrymabunda; Gloioxanthomyces vitellinus; Hypomyces chrysospermus; Stropharia caerulea; Agaricus silvaticus; Nectria leptosphaeriae; Clavulinopsis luteoalba; Leptosphaeria doliolum; Rutstroemia firma; Crepidotus cesatii; Hygrocybe ceracea; Galerina clavata; Mycena aetites; Puccinia arenariae; Pholiota alnicola; Diaporthe samaricola; Arrhenia griseopallida; Russula fragilis; Ramaria stricta and Mycena flavoalba. 7th October 2017 - Harthill Cookery School, Cheshire - A small group of 5 today but what delightful people they were. After intros and a cuppa we tootled off and although no great swathes of fungi were to be found we ended up clocking up a list of 70 species in 3 hours. The list was:- Auricularia auricula-judae; Trochila ilicina; Phacidium multivalve; Nectria cinnabarina; Gliophorus psittacina; Cystoderma amianthinum; Puccinia lagenophorae; Phragmidium violaceum; Imleria badia; Ganoderma australe; Armillaria gallica; Datronia mollis; Polyporus squamosus; Gymnopus dryophilus; Calvatia gigantea; Clitocybe nebularis; Rhytisma acerinum; Chlorophyllum rhacodes; Scleroderma citrinum; Annulohypoxylon multiforme; Rhopographus filicinus; Cortinarius hemitrichus; Paxillus involutus; Mycena galericulata; Phallus impudicus; Bjerkandera adusta; Rhodocollybia butyracea; Gymnopus confluens; Laccaria laccata; Coprinellus micaceus; Nectria episphaeria; Chaetosphaerella phaeostroma; Daldinia concentrica; Fomitopsis betulina; Hypomyces chrysospermus; Amanita muscaria; Microsphaera alphitoides; Clitocybe fragrans; Xylaria longipes; Xylaria hypoxylon; Schizopora paradoxa; Rickenella fibula; Albugo candida; Melampsora euphorbiae; Erysiphe heraclei; Bolbitius titubans; Coprinopsis lagopus; Claviceps purpureum; Leccinum scabrum; Chondrostereum purpureum; Puccinia aegopodii; Erysiphe urticae; Puccinia menthae; Stereum hirsutum; Vuilleminia comedens; Taphrina betulina; Volvopluteus gloiocephalus; Lepista flaccida; Mycena arcangeliana; Coprinopsis atramentaria; Torula herbarum; Puccinia arenariae; Hymenoscyphus rokebyensis; Cymadothea trifolii; Stropharia caerulea; Clavulinopsis helvola; Lactarius subdulcis; Galerina clavata; Entomophthora muscae and the myxo Mucilago crustacea. Not a bad do and the mushroom soup to finish was well received. 3rd October 2017 - Heaton Moor, Stockport, Cheshire - Cuphophyllus virgineus; Gliophorus laetus; Hygrocybe reidii; Cuphophyllus pratensis; Gloioxanthomyces vitellinus and Gliophorus psittacina all back on the small lawn outside my works window. Geoglossum fallax was also poking a few tongues through. 1st October 2017 - Ladybrook Valley, Bramhall, Cheshire - A trip out for a fine breakfast and a walk to burn off a few calories. There wasn't anything uncommon about but it is important all these nooks and crannies have records to help them survive. The 33 species seen were:- Pholiota aurivella; Hemimycena tortuosa; Phragmidium violaceum; Phragmidium bulbosum; Crepidotus luteolus; Mycena pseudocorticola; Hymenoscyphus rokebyensis; Hypomyces chrysospermus; Xylaria hypoxylon; Rhytisma acerinum; Xerocomellus pruinatus; Ganoderma australe; Lycoperdon pyriforme; Puccinia caricina var. ribesii-pendulae; Hyholoma fasciculare; Pucciniastrum epilobii; Coleosporium tussilaginis; Microsphaera alphitoides; Stereum hirsutum; Coprinellus micaceus; Hypoxylon fragiforme; Trametes gibbosa; Trametes versicolor; Bjerkandera adusta; Crepidotus mollis; Meripilus giganteus; Lacrymaria lacrymabunda; Aleuria aurantia; Auricularia auricula-judae; Hyphodontia sambuci; Belonidium sulphureum; Trochila laurocerasi and Kretzschmaria deusta. A few specimens of Agaricus xanthoderma were around the corner in a street where we had parked the car. 28th September 2017 - Wyevale Garden Centre, Tarporley, Cheshire - A pop off for tea and cake, under the pines outside were:- Suillus variegatus; Suillus luteus; Russula amoenolens; Ramaria abietina; Gymnopus dryophilus and Cuphophyllus virgineus. 28th September 2017 - Little Budworth, Cheshire - 5 parents and 11 home schooled youngsters were taken on a fungal mooch by myself and good lady. The sun shone, the enthusiasm remained high and after the walk myself and the missus enjoyed a wind down with the compulsory tea and cake. The list consisted of 75 species, these were:- Tricholoma fulvum; Cortinarius hemitrichus; Lactarius tabidus; Gymnopus androsaceus; Sphaeropsis sapinea; Suillus bovinus; Coltricia perennis; Lycoperdon pyriforme; Hypomyces chrysospermus; Imleria badia; Leccinum cyaneobasileucum; Annulohypoxylon multiforme; Rhodocollybia butyracea; Lycoperdon perlatum; Helvella crispa; Rickenella fibula; Daedaleopsis confragosa; Kretzschmaria deusta; Heterobasidion annosum; Mycena galericulata; Exidia glandulosa; Hypoxylon fragiforme; Stereum rugosum; Pucciniastrum epilobii; Calocera viscosa; Oudemansiella mucida; Meripilus giganteus; Leratiomyces ceres; Ganoderma australe; Leccinum scabrum; Lactarius blennius; Clitopilus prunulus; Russula nobilis; Geastrum triplex; Amanita muscaria; Nectria cinnabarina; Peniophora quercina; Microsphaera alphitoides; Trametes versicolor; Xylaria longipes; Rhytisma acerinum; Coprinellus micaceus; Exidia nucleata; Fomitopsis betulinus; Diatrype stigma; Bjerkandera adusta; Clavulina coralloides; Cyanoboletus pulverulentus; Laccaria laccata; Paxillus involutus; Inocybe geophylla var. lilacina; Chalciporus piperatus; Russula fellea; Auricularia auricula-judae; Dacrymyces stillatus; Laccaria amethystina; Scleroderma citrinum; Russula ochroleuca; Rhopographus filicinus; Trochila ilicina; Phacidium multivalve; Macrotyphula fistulosa var. contorta; Hypholoma fasciculare; Melampsoridium betulinum; Stereum hirsutum; Tubaria furfuracea; Mycena sanguinolenta; Crepidotus variabilis; Xerocomellus pruinatus; Tremella aurantia; Hymenoscyphus rokebyensis; Russula betularum; Collybia cirrhata; Melanoleuca melaleuca and Chondrostereum purpureum. 27th September 2017 - Etherow CP, Cheshire - A walk with some adult carers and 1 young carer was taken in fine weather and topped off with a tea, cake and natter finale. 43 species was the total jotted down, these were:- Tricholoma scalpturatum; Daedaleopsis confragosa; Rhytisma acerinum; Kuehneromyces mutabilis; Xylaria hypoxylon; Trochila ilicina; Pluteus chrysophaeus; Taphrina tosquinetii; Oxyporus populinus; Helvella crispa; Leotia lubrica; Ganoderma australe; Hypholoma fasciculare; Russula ochroleuca; Fomitopsis betulina; Laccaria laccata; Cortinarius alboviolaceus; Trametes versicolour; Coprinellus micaceus; Coprinopsis atramentaria; Ascocoryne cylichnium; Clavulina coralloides; Stereum hirsutum; Hypoxylon petrinae; Schizopora paradoxa; Scleroderma citrinum; Rhopographus filicinus; Puccinia aegopodii; Clavulina rugosa; Pucciniastrum circeae; Vuilleminia comedens; Albugo candida; Trametes pubescens; Hyphodontia sambuci; Lactarius pubescens; Lactarius torminosus; Lactarius pyrogalus; Leccinum scabrum; Tricholoma fulvum; Rickenella fibula; Xylaria longipes; Amanita muscaria and the myxo Lycogala epidendrum. 26th September 2017 - Daventry CP, Northamptonshire - We had no plans to do any more fungi mooching but once the ruddy eyes get zoned in we can't help ourselves. 45 species were noted whilst pottering along and looking at some bird life. The list comprised of:- Galerina marginata; Postia caesia; Mycena acicula; Coprinellus micaceus; Scleroderma citrinum; Rhytisma acerinum; Mycena tenerrima; Agaricus arvensis; Puccinia malvacaerum; Puccinia lagenophorae; Erysiphe heraclei; Auricularia auricula-judae; Hyphodontia sambuci; Microbotryum violaceum; Inocybe geophylla; Lycoperdon gigantea; Daedaleopsis confragosa; Trochila ilicina; Phacidium multivalve; Tricholoma fulvum; Trametes versicolor; Stereum hirsutum; Fistulina hepatica; Inonotus dryadeus; Puccinia glechomatis; Laccaria laccata; Mycena inclinata; Mycena galericulata; Mycena speirea; Lepista saeva; Peniophora quercina; Paxillus involutus; Cortinarius hemitrichus; Hypomyces chrysospermus; Amanita muscaria; Xylaria hypoxylon; Ganoderma applanatum; Lycoperdon perlatum; Nectria cinnabarina; Clitocybe nebularis; Polyporus leptocephalus; Dacrymyces stillatus; Coprinus comatus; Ganoderma australe and the myxo Tubifera ferruginosa. 26th September 2017 - Salcey Forest, Northamptonshire - Up at the crack and a fine breakfast at Buddies USA Diner, what a belly filler. Out for a walk and after 4 hours and some tea and cake (oh aye) we clocked up 105 species, these being:- Hymenoscyphus fructigenus; Mycena flavoalba; Melanoleuca polioleuca; Clavulinopsis luteoalba; Pluteus plautus; Baeospora myosura; Marasmiellus ramealis; Phacidium multivalve; Trochila ilicina; Pluteus cervinus; Kretzschmaria deusta; Heterobasidion annosum; Bisporella sulfurina; Daldinia concentrica; Coprinellus disseminatus; Hygrophoropsis aurantiaca; Trichaptum abietinum; Gymnopilus penetrans; Gymnopus peronatus; Postia subcaesia; Calocera cornea; Mycena epipterygia; Postia caesia; Clitocybe fragrans; Bjerkandera adusta; Rickenella fibula; Erysiphe heraclei; Mycena polygramma; Microsphaera alphitoides; Ganoderma australe; Aleuria aurantia; Polyporus squamosus; Lacrymaria lacrymabunda; Belonidium sulphureum; Phragmidium violaceum; Crepidotus cesatii; Clavulinopsis fusiformis; Marasmius setosus; Ascocoryne sarcoides; Lactarius fulvissimus; Leptosphaera doliolum; Calocera viscosa; Stropharia caerulea; Psathyrella microrhiza; Coprinellus domesticus; Helvella crispa; Entoloma rhodopolium; Puccinia circaeae; Lanzia echinophila; Diatrypella quercina; Coprinus comatus; Stereum gausapatum; Coprinellus micaceus; Clitopilus prunulus; Puccinia caricina var. ribesii-pendulae; Lepista sordida; Inocybe geophylla; Tricholoma fulvum; Rhytisma acerinum; Puccinia glechomatis; Inocybe geophylla var lilacina; Stereum hirsutum; Leccinum scabrum; Gymnopus dryophilus; Laccaria laccata; Mycena galopus; Bulgaria inquinans; Hypholoma fasciculare; Clavulina cinerea; Clavulina coralloides; Lycoperdon pyriforme; Xylaria hypoxylon; Daedaleopsis confragosa; Mycena rosea; Laccaria amethystina; Trametes versicolor; Lacatrius quietus; Mycena tenerrima; Trichoderma viride; Resupinatus applicatus; Exidia nucleata; Hyphodontia sambuci; Auricularia auricula-judae; Lactarius pyrogalus; Schizopora paradoxa; Russula ochroleuca; Hypoxylon petrinae; Mycena speirea; Byssomerulius corium; Mycena haemotopus; Mycena inclinata; Pucciniastrum circaeae; Stereum rugosum; Polyporus leptocephalus; Mycena galopus var. candida; Xylaria carpophila; Leotia lubrica; Mycena galericulata; Mutinus caninus; Diatrype stigma; Peniophora quercina; Vuilleminia comedens; Mycena acicula; Phlebia tremellosa and Scleroderma verrucosum. 25th September 2017 - Rye Meads RSPB, Hertfordshire - A birding wander with tired heads. In fact so tird we lost a ruddy bag. There was nowt in it, just a phone charger and some pills (we think) - hey ho. Fungi seen along the way were:- Agaricus arvensis; Lycoperdon gigantea; Puccinia glechomatis; Puccinia distincta; Marasmius oreades; Puccinia malvacearum and Tricholoma scalpturatum. 25th September 2017 - Fairlop Waters CP, East London - After a pop off at a farm shop for fruit and bread we had a quiet wander around this more commercialised area. 14 fungal species were recorded, these were:- Lactarius controversus; Tricholoma fulvum; Lactarius pubescens; Leccinum scabrum; Lycoperdon perlatum; Puccinia malvacearum; Agrocybe rivulosa; Coprinopsis lagopus; Paxillus involutus; Cortinarius trivialis; Dacrymyces stillatus; Stereum hirsutum; Hypomyces chrysospermus and the slime mould Fuligo septica. 25th September 2017 - Hainault Forest, East London - An early morning walk in the murk. 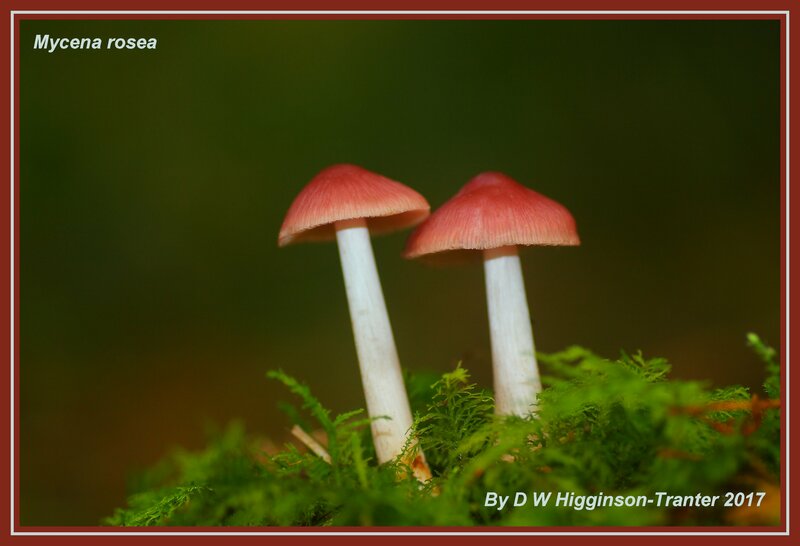 At the end of it we both had soaking feet and a list of 38 fungi, these being:- Mycena rosea; Mycena crocata; Mycena haematopus; Mycena speirea; Microsphaera alphitoides; Puccinia menthae; Trochila ilicina; Tricholoma fulvum; Xylaria hypoxylon; Lycoperdon perlatum; Coprinellus micaceus; Hygrocybe chlorophana; Hypholoma fasciculare; Lactarius tabidus; Gymnopus dryophilus; Xerula radicata; Paxillus involutus; Ganoderma australe; Trichoderma viride; Clavulina cinerea; Leccinum varicolor; Byssomerulius corium; Dacrymyces stillatus; Stereum rugosum; Diatrypella quercina; Agaricus arvensis; Stereum hirsutum; Hypoxylon fragiforme; Stereum gausapatum; Phragmidium violaceum; Rutstroemia firma; Crepidotus variabilis; Peniophora quercina; Lenzites betulina; Trametes versicolor; Schizopora paradoxa; Scutellinia crinita and Lepista flaccida. 23rd September 2017 - Marbury CP, Cheshire - 2 walks, 30 people, 102 fungi named but due to time limitations a few got away. I am in a ruddy rush but it was a lovely day and here is the list:- Stereum hirsutum; Fomes fomentarius; Trametes gibbosa; Trametes versicolor; Calocera cornea; Bjerkandera adusta; Annulohypoxylon multiforme; Fomitopsis betulina; Ganoderma australe; Scleroderma citrinum; Auricularia auricula-judae; Suillus grevellei; Daldinia concentrica; Hypoxylon fragiforme; Gymnopus peronatus; Mycena galopus; Mycena tenerrima; Amanita muscaria; Paxillus involutus; Marasmius rotula; Psathyrella candolleana; Clavulina coralloides; Trochila ilicina; Psilocybe cyanescens; Chlorophyllum rhacodes; Nectria cinnabarina; Armillaria gallica; Xylaria hypoxylon; Exidea nucleata; Aleuria aurantia; Mycena speirea; Coprinopsis lagopus; Chondrostereum purpureum; Belonidium sulphureum; Laccaria laccata; Pucciniastrum epilobii; Flammulina velutipes; Rhytisma acerinum; Tricholoma fulvum; Rickenella fibula; Dacrymyces stillatus; Hypholoma fasciculare; Kuehneromyces mutabilis; Entoloma rhodopolium; Hyphodontia sambuci; Mycena galericulata; Russula ochroleuca; Daedaleopsis confragosa; Exidia glandulosa; Oudemansiella mucida; Tremella foliacea; Coleosporium tussilaginis; Albugo candida; Ramaria stricta; Lycoperdon pyriforme; Coprinellus disseminatus; Hypomyces chrysospermus; Pluteus salicinus; Trichoderma viride; Coprinellus micaceus; Postia subcaesia; Phacidium multivalve; Schizopora paradoxa; Scleroderma verrucosum; Roridomyces roridus; Polyporus squamosus; Parasola leiocephala; Clavulinopsis helvola; Bisporella sulfurina; Leptosphaeria doliolum; Ascocoryne sarcoides; Phragmidium violaceum; Crepidotus cesatii; Crepidotus versutus; Agaricus silvaticus; Pluteus chrysophaeus; Russula praetervisa; Puccinia arenariae; Typhula setipes; Lepista flaccida; Rhopographus filicinus; Phallus impudicus; Mycena arcangeliana; Mycena rosea; Crepidotus mollis; Lacrymaria lacrymabunda; Cudoniella acicularis; Rhodocollybia butyracea; Xerocomellus cisalpinus; Pucciniastrum circaeae; Xylaria longipes; Hygrophoropsis aurantiaca; Taphrina alni; Stereum gausapatum; Bulgaria inquinans; Pluteus cervinus; Datronia mollis; Lycoperdon perlatum; Kretzschmaria deusta; Inocybe geophylla; Bolbitius titubans and the myxo Tubifera ferruginosa. 22nd September 2017 - River Mersey, Stockport, Cheshire - Tricholoma populinum; Leccinum scabrum; Paxillus involutus; Lycoperdon perlatum and Pholiota gummosa were all noted whilst walking into town. 18th September 2017 - Chadkirk Chapel, Stockport, Cheshire - A catch up with a fellow keen naturalist after he had found a fungus that needed further investigation. Fungi were hard to come by but we had a decent stroll and after much mooching and a bit of microscopy came up with 64 species:- Melanotus horizontalis; Crepidotus variabilis; Crepidotus cesatii; Hymenoscyphus rokebyensis; Peziza praetervisa; Ascocoryne sarcoides; Phragmidium violaceum; Puccinia aegopodii; Albugo candida; Rickenella fibula; Amanita muscaria; Chalciporus piperatus; Scleroderma citrinum; Chaetosphaerella phaeostroma; Auricularia auricula-judae; Gloeophyllum sepiarium; Plicatura crispa; Polyporus leptocephalus; Calocera cornea; Xylaria carpophila; Fomitopsis betulina; Crepidotus mollis; Pleurotus ostreatus; Exidia nucleata; Mycena speirea; Gymnopus peronatus; Kuehneromyces mutabilis; Leotia lubrica; Datronia mollis; Nectria cinnabarina; Clavulina cristata; Trichoderma viride; Kretzschmaria deusta; Neobulgaria pura var. foliacea; Neobulgaria pura; Diatrype stigma; Tubaria furfuracea; Peniophora quercina; Vuilleminia comedens; Hypoxylon fragiforme; Scleroderma verrucosum; Hyphodontia sambuci; Laccaria laccata; Lycoperdon pyriforme; Phacidium multivalve; Xylaria hypoxylon; Armillaria gallica; Xylaria longipes; Trametes gibbosa; Puccinia circeae; Pucciniastrum circeae; Daldinia concentrica; Trametes versicolor; Mycena galopus; Stereum hirsutum; Ganoderma australe; Puccinia epilobii; Erysiphe heraclei; Trochila ilicina; Coleosporium tussilaginis; Microsphaera alphitoides; Rhytisma acerinum; Tarzetta cupularis and Puccinia caricina var. ribesii-pendulae. 17th September 2017 - Dunwood Park, G. Manchester - After the public fungal foray we headed to this new location to indulge in some tea and cake - and ruddy lovely it was. We had a wander afterwards and clocked up 23 fungal species, these were:- Crepidotus mollis; Trametes versicolor; Daldinia concentrica; Chondrostereum purpureum; Xylaria hypoxylon; Bjerkandera adusta; Stereum hirsutum; Russula ochroleuca; Laccaria laccata; Scleroderma verrucosum; Lactarius quietus; Rhopographus filicinus; Stereum rugosum; Pucciniastrum epilobii; Scleroderma citrinum; Hypoxylon fragiforme; Daedaleopsis confragosa; Fomitopsis betulina; Hypholoma fasciculare; Calocera cornea; Xylaria polymorpha; Ganoderma australe and Exidia nucleata. 17th September 2017 - Crompton Moor, G. Manchester - A lovely walk today in some familiar company and with a couple of new faces. 4 hours yomping up and down the moors and a bit of microscopy produced a varied list of 81 species, these being:- Pucciniastrum epilobii; Puccinia caricina var. ribesii-pendulae; Daedaleopsis confragosa; Rhytisma acerinum; Melampsoridium betulinum; Nectria cinnabarina; Polyporus leptocephalus; Mycena speirea; Xylaria hypoxylon; Lycoperdon pyriforme; Fomitopsis betulina; Exidia nucleata; Auricularia auricula-judae; Chaetosphaerella phaeostroma; Hypocrea pulvinata; Roridomyces roridus; Mycena galericulata; Claviceps purpurea; Cortinarius hemitrichus; Sphaeropsis sapinea; Puccinia lagenophorae; Albugo candida; Tricholoma fulvum; Lactarius glyciosmus; Lactarius turpis; Laccaria laccata; Leccinum versipelle; Paxillus involutus; Trametes versicolor; Gloeophyllum sepiarium; Dacrymyces stillatus; Daldinia concentrica; Suillus luteus; Leccinum scabrum; Hypomyces chrysospermus; Stereum hirsutum; Gymnopus dryophilus; Microsphaera alphitoides; Lactarius quietus; Suillus grevellei; Mycena pura; Illosporiopsis christiansenii; Taphrina tosquinetii; Gliophorus laetus; Russula ochroleuca; Peziza badia; Lactarius tabidus; Annulohypoxylon multiforme; Mycena sanguinolenta; Laccaria proxima; Calocera pallidospathulata; Cystoderma amianthinum; Stereum sanguinolentum; Hygrophorus hypothejus; Postia caesia; Heterobasidion annosum; Phaeolus schweinitzii; Hypholoma fasciculare; Hypholoma capnoides; Gymnopus androsaceus; Hygrophoropsis aurantiaca; Calocera viscosa; Trochila ilicina; Trichaptum abietinum; Coleosporium tussilaginis; Lycoperdon nigrescens; Rhodocollybia butyracea; Mycena tenerrima; Hyphodontia sambuci; Taphrina alni; Phragmidium violaceum; Crepidotus cesatii; Crepidotus variabilis; Penicillium brevicompactum; Galerina vittiformis; Lactarius rufus; Melanoleuca friesii; Marasmius setosus; Russula fragilis; Gloioxanthomyces vitellinus and the myxo Ceratiomyxa fruticulosa. 10th September 2017 - Greenfields NR, Cheshire - After a tea and cake break we had a walk around the 2 fishing ponds at this small reserve and came up with 30 species of fungal growth, these were:- Scleroderma citrinum; Calocera cornea; Schizopora paradoxa; Postia subcaesia; Vuilleminia comedens; Xylaria hypoxylon; Tubaria dispersa; Rickenella fibula; Rickenella swartzii; Gymnopus dryophila; Nectria cinnabarina; Marasmius rotula; Stereum hirsutum; Peniophora quercina; Exidia nucleata; Dacrymyces stillatus; Paxillus involutus; Bjerkandera adusta; Microsphaera alphitoides; Erysiphe heraclei; Belonidium sulphureum; Chondrostereum purpureum; Stereum rugosum; Hypholoma fasciculare; Puccinia behenis; Leptosphaeria doliolum; Scleroderma verrucosum; Parasola kuehneri and Tricholoma album. Note must be made of the Tricholoma that took some time to actually get to grips with due to a weathered appearance. It was growing with Oak and the unevenly notched gills, the spores, lack of bruising and the distinct honey-like smell all gave the game away after ploughing through much literature and on-line information. 10th September 2017 - Little Budworth CP, Cheshire - The final pre-season mooching day before the public forays begin. Myself, good lady and equally good daughter had a quiet wander, the end list was a below average 55 species but hey, for 2 hours that ain't too bad. The species seen were:- Pleurotus ostreatus; Daedaleopsis confragosa; Lactarius tabidus; Ganoderma australe; Ganoderma applanatum; Auricularia auricula-judae; Claviceps purpurea; Gymnopus androsaceus; Hypholoma fasciculare; Melampsoridium betulinum; Heterobasidion annosum; Phallus impudicus; Geastrum triplex; Microsphaera alphitoides; Russula ochroleuca; Rickenella fibula; Fomitopsis betulinus; Calocera viscosa; Datronia mollis; Mycena galericulata; Xylaria hypoxylon; Schizopora paradoxa; Diatrype disciformis; Sphaeropsis sapinea; Pucciniastrum epilobii; Tubaria furfuracea; Xerula radicata; Leratiomyces ceres; Hypoxylon fragiforme; Meripilus giganteus; Ganoderma australe; Amanita rubescens; Scleroderma verrucosum; Hypomyces chrysospermus; Trochila ilicina; Russula nobilis; Russula fellea; Cantharellus cibarius; Russula nigricans; Rhytisma acerinum; Exidia nucleata; Nectria cinnabarina; Stereum hirsutum; Dacrymyces stillatus; Rhopographus filicinus; Scleroderma citrinum; Annulohypoxylon multiforme; Bjerkandera adusta; Phragmidium violaceum; Clavulinopsis helvola; Hymenoscyphus rokebyensis; Mycena tenerrima; Gymnopus brassicolens; Mycena flavoalba and Trametes versicolor. 4th September 2017 - Fletcher Moss, W. Didsbury, G. Manchester - Agrocybe rivulosa; Xerula radicata; Daedaleopsis confragosa; Belonidium sulphureum; Patellaria atrata and Torula herbarum were noted whilst pootling about. 4th September 2017 - Marie Louise Gardens, W. Didsbury, G. Manchester - A break from the cycling and a nosey around this tucked away place:- Echinoderma asperum; Geastrum triplex; Peniophora quercina; Marasmius rotula; Stereum hirsutum; Trametes versicolor; Bjerkandera adusta; Inonotus hispidus; Rhytisma acerinum; Torula herbarum; Auricularia auricula-judae; Meripilus giganteus; Melampsora hypericorum; Melampsora euphorbiae; Pucciniastrum epilobii; Trochila ilicina; Leptosphaeria doliolum and Microsphaera alphitoides were the species seen. 28th August 2017 - Bramhall Park, Stockport, Cheshire - A birthday walk after a cracking full English breakfast, species seen were:- Laccaria amethystina; Daldinia concentrica; Datronia mollis; Rhytisma acerinum; Chaetosphaerella phaeostroma; Scleroderma verrucosum; Lycoperdon pyriforme; Laccaria laccata; Heterobasidion annosum; Eryspihe heraclei; Microsphaera alphitoides; Coprinellus micaceus; Daedaleopsis confragosa; Taphrina tosquinetii; Hypholoma fasciculare; Ganoderma australe; Tricholoma fulvum; Pucciniastrum epilobii; Puccinia caricina var. ribesii-pendulae; Calocera cornea; Trametes versicolor; Xylaria longipes; Stereum hirsutum; Fomitopsis betulina; Pucciniastrum circaea; Auricularia auricula-judae; Kretzschmaria deusta; Phaeolus schweinitzii; Paxillus involutus; Hypomyces chrysospermus; Agaricus xanthodermus and the myxos Fuligo septica and Lycogala terrestre. 27th August 2017 - Styal CP, Cheshire - Only 28 species of fungi on an early morning walk in a very dry woodland:- Trametes gibbosa; Stereum hirsutum; Scleroderma citrinum; Trametes versicolor; Rhytisma acerinum; Erisyphe heraclei; Microsphaera alphitoides; Ganoderma australe; Postia caesia; Lepiota cristata; Phlebia tremellosa; Hypholoma fasciculare; Datronia mollis; Crepidotus mollis; Trochila ilicina; Rhopographus filicinus; Pucciniastrum epilobii; Hymenochaete rubiginosa; Meripilus giganteus; Bjerkandera adusta; Claviceps purpurea; Calocera viscosa; Laccaria amethystina; Boletus edulis; Laccaria laccata; Scleroderma verrucosum; Fomitopsis betulinus; Agaricus arvensis; Xylaria longipes; Ganoderma applanatum; Royoporus badius and Puccinia glechomatis. 26th August 2017 - Sett Valley Trail, New Mills, Derbyshire - A trip out on the train to see some non-league football, a small pop in to this riverside area, only 12 species of fungi were seen:- Hypoxylon petrinae; Erysiphe heraclei; Coleosporium tussilaginis; Puccinia aegopodii; Daldinia concentrica; Hyphodontia sambuci; Synchytrium taraxci; Claviceps purpurea; Trametes versicolor; Rhytisma acerinum; Daedaleopsis confragosa and Puccinia veronicae. 24th August 2017 - Pole Bank, Stockport, Cheshire - A tip off regarding a rare fungus so myself and my good lady popped up after work and had a 60 minute mooch. We found the sought after shroom, Guepinia helvelloides plus Porpolomopsis calyptriformis; Trochila ilicina; Mycoacia uda; Agaricus arvensis; Agaricus langei; Phacidium multivalve; Lepiota cristata; Claviceps purpurea; Rhytisma acerinum; Bjerkandera adusta; Daldinia concentrica; Calocybe carnea and the myxo Fuligo septica. 21st August 2017 - Cheadle Heath, Stockport, Cheshire - Putting the moth trap out in the garden and tucking back some Greater Willowherb when lo and behold 2 specimens of Chlorophyllum rhacodes were seen beneath 2 young Leylandii trees. What a lovely bonus! 20th August 2017 - Errwood/Fernilee Reservoirs, Derbyshire - I led a walk today for a small group of friends with an interest in the fungal world. I expected a decent return of around half a ton but what we got was a splendid early season haul of 126 species. The list was:- Kretzschmaria deusta; Ganoderma australe; Rhytisma acerinum; Cortinarius bolaris; Lactarius blennius; Russula nobilis; Bjerkandera adusta; Trametes versicolor; Russula fellea; Helvella macropus; Coprinellus micaceus; Paxillus involutus; Exidia thurietiana; Hypoxylon fuscum; Trochila ilicina; Cantharellus cibarius; Leotia lubrica; Russula nigricans; Coleosporium tussilaginis; Laccaria laccata; Hygrophoropsis aurantiaca; Gymnopilus penetrans; Postia caesia; Gymnopus dryophilus; Claviceps purpurea; Sphaeropsis sapinea; Amanita rubescens; Amanita excelsa; Laccaria amethystina; Clitopilus prunulus; Clitocybe odora; Neoboletus luridiformis; Cortinarius hemitrichus; Calocera cornea; Clavulina rugosa; Boletus edulis; Stereum hirsutum; Microsphaera alphitoides; Rhopographus filicinus; Neobulgaria pura; Nectria episphaeria; Hypoxylon fragiforme; Trichoderma viride; Pucciniastrum epilobii; Amanita citrina; Gymnopus confluens; Pucciniastrum circeae; Calocera pallido-spathulata; Hypholoma fasciculare; Amanita muscaria; Lycoperdon perlatum; Fomitopsis betulina; Russula ochroleuca; Oudemansiella mucida; Suillus grevellei; Nectria cinnabarina; Puccinia circaeae; Stereum rugosum; Taphrina betulina; Lactarius tabidus; Hypomyces chrysospermus; Amanita crocea; Leccinum variicolor; Imleria badia; Russula claroflava; Leccinum scabrum; Tremella foliacea; Heterobasidion annosum; Scleroderma citrinum; Melampsoridium betulinum; Calocera viscosa; Agaricus arvensis; Dacrymyces stillatus; Trichaptum abietinum; Stereum sanguinolentum; Skeletocutis amorpha; Schizopora paradoxa; Xylaria hypoxylon; Mycena acicula; Mycena galopus; Mycena galericulata; Rickenella fibula; Crepidotus mollis; Polyporus badius; Gymnopilus penetrans; Megacollybia platyphylla; Peniophora quercina; Belonidium sulphureum; Puccinia glechomatis; Tubaria furfuracea; Tylopilus felleus; Kuehneromyces mutabilis; Trametes gibbosa; Lactarius quietus; Polyporus leptocephalus; Exidia glandulosa; Xerocomellus cisalpinus; Lactarius aurantiacus; Clavulina cristata; Entoloma rhodopolium; Mycena tenerrima; Lactarius glyciosmus; Hygrocybe nigrescens; Xylaria longipes; Hypoxylon petrinae; Coprinus comatus; Xerocomellus pruinatus; Crepidotus cesatii; Crepidotus luteolus; Tarzetta cupularis; Bisporella sulfurina; Ascocoryne sarcoides; Lyophyllum connatum; Phragmidium violaceum; Tricholoma ustale; Leptosphaeria acuta; Mycena speirea; Inocybe griseolilacina; Inocybe muricellata; Lactarius fulvissimus; Lachnum virgineum; Scutellinia scutellata; Mycena leptocephala; Russula cyanoxantha; Hygrocybe cantharellus and Parasola leiocephala. 18th August 2017 - Heaton Moor, Stockport, Cheshire - A small collection of Hygrocybe reidii were on the lawn outside work - lovely. 17th August 2017 - Tatton Park, Cheshire - A walk cut short by the Achilles Tendon giving some real aggravation. I returned home limping and fed up, what a trial. Before giving in I clocked up 63 species, these were:- Kretzschmaria deusta; Coprinellus micaceus; Hypoxylon petriniae; Bulgaria inquinans; Phacidium multivalve; Trochila ilicina; Pucciniastrum circeae; Puccinia caricina var ribesii pendulae; Laccaria amethystina; Datronia mollis; Puccinia circaeae; Taphrina betulina; Puccinia epilobii; Coleosporium tussilaginis; Fomes fomentarius; Amanita muscaria; Leccinum scabrum; Fomitopsis betulinus; Lycoperdon utriform; Hypoxylon fragiforme; Exidia glandulosa; Calocera cornea; Trametes gibbosa; Trichoderma viride; Meripilus giganteus; Daedaleopsis confragosa; Dacrymyces stillatus; Vuilleminia comedens; Peniophora quercina; Claviceps purpurea; Rhytisma acerinum; Macrolepiota procera; Sphaeropsis sapinea; Mycena galopus var. candida; Gymnopus confluens; Xerocomellus chrysenteron; Gymnopus peronatus; Gymnopilus penetrans; Calocera pallido-spathulata; Trichaptum abietinum; Nectria cinnabarina; Melampsoridium betulinum; Microsphaera alphitoides; Rhopographus filicinus; Stereum gausapatum; Ganoderma australe; Gymnopilus junonius; Bjerkandera adusta; Trametes versicolor; Mycena galericulata; Paxillus involutus; Scleroderma citrinum; Schizopora paradoxa; Belonidium sulphureum; Stereum rameale; Stereum hirsutum; Albugo candida; Auricularia auricula-judae; Exidia nucleata; Phragmidium violaceum Amanita rubescens; Hohenbuehelia cyphelliformis and the myxo Tubifera ferruginosa. 15th August 2017 - Heaton Moor, Stockport, Cheshire - 2 specimens of Porpolomopsis calyptriformis and a couple of Rickenella fibula were noted on a lawn where I sit and have a dinner-time read. The 20th Pan Book of Horror was the chosen tome today - delicious. 14th August 2017 - Bruntwood Park, Stockport, Cheshire - A cycle ride and a fungus mooch, species seen were:- Russula amoenolens; Russula heterophylla; Amanita ceciliae; Belonidium sulphureum; Ganoderma australe; Marasmius oreades; Erysiphe heraclei; Microsphaera alphitoides; Nectria peziza; Puccinia epilobii; Rhytisma acerinum; Coprinellus micaceus; Claviceps purpurea; Amanita rubescens; Vuilleminia comedens; Scleroderma verrucosum; Albugo candida; Fomitopsis betulina; Hypocrea pulvinata; Meripilus giganteus; Bjerkandera adusta; Trametes gibbosa; Stereum hirsutum; Lacrymaria lacrymabunda; Pucciniastrum circeae; Puccinia caricina var ribesii pendulae; Sphaeropsis sapinea; Heterobasidion annosum; Hypholoma fasciculare; Auricularia auricula-judae; Clitopilus daamsii; Ramaria stricta and Trametes versicolor. 14th August 2017 - Cheadle, Stockport, Cheshire - Cycling down the road and I spotted some fungi. A quick pull up, a pluck of one specimen and a check at home - Suillus collinitus was the species. 13th August 2017 - Lathkill Dale, Derbyshire - A cracking walk with the lasses today with many things seen although fungi were sparse on the ground. The end list was:- Agrocybe erebia; Coleosporium tussilaginis; Puccinia menthae; Erysiphe heraclei; Rhytisma acerinum; Nectria cinnabarina; Auricularia auricula-judae; Coprinellus micaceus; Exidia nucleata; Claviceps purpurea; Vuilleminia comedens; Hypoxylon petriniae; Nectria episphaeria; Hypoxylon fuscum; Trichoderma viride; Hypoxylon fragiforme; Hypholoma fasciculare; Crepidotus mollis; Polyporus leptocephalus; Trametes versicolor; Pluteus nanus; Pluteus chrysophaeus and Lepiota cristata. 12th August 2017 - Sidings Lane NR, Lancashire - A quick walk after the football trip out. 27 species of fungus were seen in 45 minutes, these being:- Cyanoboletus pulverulentus; Hypomyces chrysospermus; Coprinellus micaceus; Scleroderma citrinum; Microsphaera alphitoides; Agaricus xanthodermus; Clavulina rugosa; Erysiphe heraclei; Stereum hirsutum; Mycena galopus; Paxillus involutus; Laccaria laccata; Annulohypoxylon multiforme; Lactarius quietus; Geastrum triplex; Hyphodontia sambuci; Lycoperdon pyriforme; Rhytisma acerinum; Trametes versicolor; Trochila ilicina; Kuehneromyces mutabilis; Fomitopsis betulina; Bjerkandera adusta; Xylaria hypoxylon; Lactarius tabidus; Coprinellus disseminatus and Lepiota cristata. 11th August 2017 - Heaton Moor, Stockport, Cheshire - Cycling home from work but a stop off to salute 2 examples of The Prince (Agaricus augustus) - a splendid fungus it is. 9th August 2017 - Trafford Centre, G. Manchester - Picking our daughter up again so I had a quick 30 minute mooch here and there. Tricholoma scalpturatum; Claviceps purpurea; Xerocomellus cisalpinus; Hygrocybe nigrescens; Erysiphe heraclei; Lepiota cristata; Marasmius oreades; Leccinum scabrum and Lycoperdon pratense were the fungi found. 8th August 2017 - Heaton Moor, Stockport, Cheshire - A dinnertime walk in the rain, a book on Vincent Van Gogh purchased and 4 fungi seen, these being:- Gloioxanthomyces vitellinus; Hygrocybe nigrescens; Marasmius rotula and Rickenella fibula. It keeps the eye on the myco-ball. 7th August 2017 - Abney Hall, Stockport, Cheshire - A 2 mile walk, a 2 mile bike rie, 1 hour mooching around this nearby location, the result was:- Amanita rubescens; Agaricus xanthodermus (*54); Pluteus umbrosus; Mycena acicula; Polyporus leptocephalus; Scleroderma verrucosum; Schizophyllum commune; Pluteus cervinus; Hypholoma fasciculare; Marsmius rotula; Polyporus squamosus; Belonidium sulphureum; Xerula radicata; Auricularia auricula-judae; Inocybe geophylla; Paxillus involutus; Schizopora paradoxa; Trochila ilicina; Ganoderma australe; Rhytisma acerinum; Kretzschmaria deusta; Belonidium mollissimum; Mycena pseudocorticola; Bisporella sulfurina; Collybia cookei; Hebeloma helodes and Leptosphaeria doliolum. 6th August 2017 - Trafford Centre, G. Manchester - My daughter was working as an usher for the kids show 'In The Night Garden' so whilst waiting to pick her up I had a mooch for some fungi around the car park area. The security noted me lurking and pulled me over, I explained myself and with smiles they went on their way. I found:- Coprinus comatus; Paxillus involutus; Suillus bovinus and Leccinum scabrum - not bad for a 10 minute tootle. 6th August 2017 - Cannon Hall CP, S. Yorkshire - Prior to a non-league FA cup encounter myself and my good lady had a mooch at this interesting area. A superb Full-English breakfast was devoured, a wander around the farm shop, craft sale and gardens was taken and in between it all a stroll was enjoyed in the gratifying sun. A few fungus were noted, these being:- Leccinum duriusculum; Lactarius quietus; Pluteus cervinus; Russula atropurpurea; Claviceps purpurea; Ganoderma australe; Amanita rubescens; Xerocomellus cisalpinus; Xerocomus subtomentosus; Hypholoma fasciculare; Trametes gibbosa; Meripilus giganteus and Erysiphe heraclei. 5th August 2017 - Chorlton WP, G. Manchester - A walk with my young daughter, fungi were mainly absent but I did manage to scrape a Dark Earthball (Scleroderma verrucosum); Willowherb Rust (Puccinia pulverulenta) and the Conifer Mazegill (Gloeophyllum sepiarium). 4th August 2017 - Heaton Moor, Stockport, Cheshire - 114 specimens of The Yellow Stainer (Agaricus xanthodermus) were noted along a short hedge were many Sycamore trees loomed large. Also noted were 5 specimens of The Blusher (Amanita rubescens) bursting through a lawn besides a healthy looking Silver Birch. 3rd August 2017 - Heaton Mersey, Stockport, Cheshire - Laccaria laccata was found in a small group at the side of a well walked pathway along with a small collection of Paxillus involutus. Just a few metres back and a close clustered group of Tricholoma scalpturatum were found beneath a collection of young trees. 2nd August 2017 - Heaton Moor, Stockport, Cheshire - A good specimen of Meripilus giganteus was growing from a hidden root system and 2 examples of Agaricis arvensis were growing in some sparse grass at the side of a wall. 1st August 2017 - Heaton Mersey, Stockport, Cheshire - 25 specimens of the Brown Birch Bolete (Leccinum scabrum) were located beneath a roadside Silver Birch along with a few examples of the Bleached Brittlegill (Russula exalbicans). 31st July 2017 - Fletcher Moss, G. Manchester - Out on the bike and after a cup of cha' on a nearby park I had a wander to see what fungal growths I could uncover. The result was a hard found 36 species:- Hypoxylon petriniae; Stereum hirsutum; Annulohypoxylon multiforme; Rhytisma acerinum; Daedaleopsis confragosa; Erysiphe heraclei; Microsphaera alphitoides; Trichoderma viride; Nectria cinnabarina; Trametes versicolor; Puccinia circaeae; Pucciniastrum circaeae; Puccinia caricina var. ribesii-pendulae; Ganoderma australe; Coleosporium tussilaginis; Torula herbarum; Laccaria laccata; Hypholoma fasciculare; Heterobasidion annosum; Tricholomopsis rutilans; Mycena galopus; Claviceps purpurea; Marasmius rotula; Trichaptum abietinum; Bjerkandera adusta; Postia caesia; Coprinellus disseminatus; Crepidotus mollis; Bisporella citrina; Leptosphaeria doliolum; Dendryphion commosum; Puccinia glechomatis; Puccinia hieracii; Mycena leptocephala; Marasmiellus vaillantii and Hymenoscyphus aesculi. The latter species took some nailing but on-line research and the centrally inflated spores confirmed ID - tis all a learning curve. 29th July 2017 - Marford Quarry, Wrexham - Fomitopsis betulina; Daedaleopsis confragosa; Puccinia aegopodii; Puccinia circaeae; Coprinellus disseminatus; Russula exalbicans were the only fungi seen on a short wander. 29th July 2017 - Talacre Beach, Flintshire - Claviceps purpurea; Marasmius oreades and Bovista plumbea were noted after visiting the local cafe. 29th July 2017 - Bishops Wood, Denbighshire - Phragmidium sanguisorbae was seen on the leaves of Salad Burnet and Rhytisma salicinum was later identified. 29th July 2017 - Maes Hiraddug NWWT, Denbighshire - A few bugs and blooms but my good lady spied Pucciniastrum agrimoniae growing on the leaves of Common Agrimony. 29th July 2017 - Rhuddlan Nature Reserve, Denbighshire - The aim today was to visit a few new places and see what the wildlife was like. As per a few fungi were noted, these being:- Erysiphe heraclei; Puccinia malvacearum; Erysiphe depressa; Uromyces geranii; Puccinia glechomatis; Scleroderma verrucosum and Microbotryum lychnidis-dioicae. 29th July 2017 - Cheadle Heath, Stockport, Cheshire - The first Giant Puffball (Lycoperdon gigantea) was seen in its usual spot just before getting on the motorway. 26th July 2017 - River Mersey, Stockport, Cheshire - An early finish and a walk home down an old route. Coprinopsis lagopus was on woodchip and 2 Inocybe species were found. Microscopy was obviously needed and after a couple of hours the species growing with Hornbeam tuned out to be Inocybe phaeodisca and the one with Hazel was Inocybe cincinnata var cincinnata. It was a careful process identifying both with caulocystidia searched for and checked in both upper and lower parts of the stem and then the hymenial cystidia checked, measured and compared with the cheilocystidia. Ammonia was used initially and then Congo Red. Re-checks through the key is always crucial with these species then comparisons on-line and the reading of several additional descriptions is a must. It isn't easy this fungal lark but patience is the key. 25th July 2017 - Heaton Moor, Stockport, Cheshire - A walk in the dinner hour, Amanita rubescens and Xerocomellus cisalpinus were the only fungi seen. 24th July 2017 - Abney Hall, Stockport, Cheshire - Walking back from the garden centre with my daughter and 3 cracking specimens of Trichomolopsis rutilans on a half-buried log and a fairly large example of Polyporus leptocephalus on a piece of wood that was almost finished. 23rd July 2017 - Poynton Pool, Cheshire - A family walk to keep the flow flowing. The fungi noted were:- Puccinia aegopodii; Marasmius rotula; Trochila ilicina; Trametes gibbosa; Stereum hirsutum; Torula herbarum; Calocera pallidospathulata; Puccinia pulverulenta; Hypoxylon fragiforme and Neoboletus luridiformis. 22nd July 2017 - Mere Sands Wood, Lancashire - An afternoon stroll in glorious sunshine, 60 species of fungi noted, these being:- Trichaptum abietinum; Claviceps purpurea; Coleosporium tussilaginis; Pucinnia poarum; Erysiphe heraclei; Scleroderma aerolatum; Melanoleuca verrucipes; Stereum hirsutum; Amanita fulva; Daedaleopsis confragosa; Psathyrella candolleana; Mycena galopus; Chaetosphaerella phaeostroma; Lactarius tabidus; Mycena tenerrima; Rhopographus filicinus; Amanita rubescens; Pluteus cervinus; Kuehneromyces mutabilis; Annulohypoxylon multiforme; Trametes versicolor; Imleria badia; Sphaeropsis sapinea; Microsphaera alphitoides; Stereum sanguinolentum; Calocera pallido-spathulata; Skeletocutis amorpha; Melanotus horizontalis; Scleroderma citrinum; Paxillus involutus; Phallus impudicus; Ganoderma australe; Trametes gibbosa; Rhytisma acerinum; Bjerkandera adusta; Chondrostereum purpureum; Nectria cinnabarina; Stereum rameale; Auricularia auricula-judae; Trochila ilicina; Puccinia circaeae; Hypomyces chrysospermus; Bolbitius titubans; Datrinia mollis; Polyporus tuberaster; Russula claroflava; Fomitopsis betulina; Marasmius rotula; Taphrina alni; Xylaria carpophila; Hypholoma fasciculare; Albugo candida; Exidia glandulosa; Crepidotus variabilis; Crepidotus cesatii; Puccinia behenis; Russula amoenolens; Russula parazurea; Marasmiellus vaillantii and Puccinia arenariae. 19th July 2017 - Chadkirk Chapel, Stockport, Cheshire - Leading a Carers walks and 14 species of fungi were discussed amongst the bugs, blooms and beasties. Puccinia caricina var. ribesii-pendulae; Puccinia veronicae; Puccinia circaeae; Ganoderma resinaceum; Ganoderma australe; Calocera cornea; Kretzschmaria deusta; Trametes versicolor; Hypoxylon fragiforme; Datronia mollis; Pluteus romellii; Polyporus squamosus and Claviceps purpurea. 16th July 2017 - Brockadale NR, N. Yorkshire - Still bug hunting but Microbotryum violaceum and Puccinia galii-cruciatae were both noted. 12th July 2017 - Fletcher Moss, Didsbury, G. Manchester - Puccinia circaeae; Daedaleopsis confragosa; Nectria cinnabarina; Marasmius rotula; Stereum hirsutum; Trametes versicolor and Bolbitius titubans were a few fungi noted whilst mooching for bugs. 11th July 2017 - Heaton Moor, Stockport, Cheshire - 9 specimens of Neoboletus luridiformis were found around some Lime Trees whilst Uromyces polygoni-avicularis was found on the leaves of Knot-Grass. 2nd July 2017 - Moore NR, Cheshire - 4 species of fungi noted on today's bug mooch - Scleroderma verrucosum; Melampsora hypericorum; Marasmius oreades and Microbotryum stellariae. 26th June 2017 - Etherow CP, Stockport, Cheshire - Puccinia annularis; Triphragmium ulmariae; Puccinia veronicae and Puccinia phragmitis were noted whilst out bugging plus the myxo Reticularia lycoperdon. 14th June 2017 - River Mersey, Stockport, Cheshire - Coprinellus disseminatus was seen on buried wood. 13th June 2017 - Heaton Mersey/River Mersey, Stockport, Cheshire - Puccinia pulverulenta; Puccinia veronicae and Microsphaera alphitoides were noted on the way home - I am getting my eye back in. 11th June 2017 - Lavender Tea Barn, Cheshire - Tea and cake after a day out and Marasmius oreades; Bolbitius titubans and Psathyrella candolleana all noted. 11th June 2017 - Billinge Flash Ponds, Cheshire - Cerioporus squamosus and a fungus on a Yellow Dung Fly (Scathophaga stercoraria) that I presume is Entomophthora muscae but after research it now appears there are two to consider and I didn't take a specimen - hey ho. 11th June 2017 - Shakerley Mere, Cheshire - Some common species in amongst a day of bug-mooching. Trametes versicolor; Fomitopsis betulina; Rhopographus filicinus; Fomes fomentarius; Stereum hirsutum and Puccinia urticae were all noted. The species known as Fomitopsis betulina is the Birch Polypore by the way, one of many recent changes to the latin names that really does ruin things for the amateur naturalist. If on my walks I use either name please don't mind, to us all it is still a Birch Polypore or Razor Strop Fungus - we all know what that is! Cheers and don't let the chaos ruin your enjoyment of the fungal world. 29th May 2017 - Lymm Dam, Cheshire - A wander to ease the heads and bodies of the HT Three and a nice stroll indeed. Pleurotus ostreatus; Stereum histutum; Hypholoma fasciculare; Trametes versiciolor; Bjerkandera adusta; Ganoderma australe; Trametes gibbosa; Hypoxylon fragiforme and Exidia plana were all found in association with Fagus whilst a stonking specimen of Laetiporus sulphureus was on a fallen Quercus trunk. 28th May 2017 - Eyarth Rocks, Denbighshire - Not doing much with fungi lately as my eye is on the bugging front. A walk at this Butterfly Reserve was thoroughly enjoyed and I did note diown:- Daldinia fissa; Puccinia sessilis; Piptoporus betulinus; Microbotryum silenes-dioicea and Puccinia punctiformis. Not a lot but it keeps the distracted head ticking till the season proper. 8th May 2017 - Marbury CP, Cheshire - Triphragmium ulmariae was seen for the first time this year. 7th May 2017 - Pot Hole Quarry, Denbighshire - A wildlife wander with some keen bods and only a few fungi noted, these being:- Uromyces ficariae; Entyloma ficariae; Uromyces dactylidis; Puccinia tumida; Puccinia sessilis; Encoelia furfuracea; Calocybe gambosa; Daldinia concentrica and Kretzschmaria deusta. 23rd April 2017 - Chorlton WP, G. Manchester - A bike ride in the sun with one eye on the bug life but Melampsorella symphyti was very noticeable on its host plant. 22nd April 2017 - Anchor Ground, Darwen, Lancashire - Prior to a football match we had a wander at the back of the ground in search of wildlife. 133 specimens of Panaeolus semiovatus were found on a small straw heap, a species I had only ever seen growing in ones or twos before. 9th April 2017 - Fletcher Moss, G. Manchester - 7 specimens of Verpa conica were now present as well as a few fruiting bodies of Tubaria dispersa. Melampsora hypericorum was now growing on Tutsan leaves. 3rd April 2017 - Fletcher Moss, G. Manchester - 4 specimens of the Thimble Morel (Verpa conica) and a fresh cluster of the Two Toned Pholiota (Kuehneromyces mutabilis) were all that was noted on a cycle trip in the sun. 2nd April 2017 - Leverhulme NR, Bolton, Lancashire - Bauhinus marginalis was everywhere and other rusts noted were the common Uromyces dactylidis; Uromyces ficariae and Uromyces muscari. Bjerkandera adusta and Daedaleopsis confragosa were also noted. 27th March 2017 - Gatley Carrs, Stockport, Cheshire - A general mooch, Melampsora allii-populina; Uromyces ficariae; Entyloma ficaria and the False Puffball myxomycete (Enteridium lycoperdon) was all that was noted. 26th March 2017 - Fletcher Moss, G. Manchester - Calocybe gambosa and Lyophyllum decastes both fruiting. 23rd March 2017 - River Mersey, Stockport, Cheshire - Melampsora allii-populina was now on the leaves of Ramsons and Uromyces dactylidis was on the leaves of Lesser Celandine. 6th March 2017 - Roman Lakes, Stockport, Cheshire - A birding venture but a few fungi for the site recorded:- Daedaleopsis confragosa; Hemimycena mauritanica; Radulomyces molaris; Sarcoscypha austriaca; Nectria cinnabarina; Stereum hirsutum; Kretzschmaria deusta and Auricularia auricula-judae. The Hemimycena was a swine to nail down and took several hours but the lack of any definite gills, spore shape and size, habitat, cheilocystida and the stipitipellis hyphae with excrescences all combined to give the game away. 26th February 2017 - Haughton Dale LNR, Denton, G. Manchester - A birding wander but listing a few fungi for a new recording area. Nothing outrageous but these things need putting on the map to start building up the greater picture. Flammulina velutipes; Lycoperdon pyriforme; Daedaleopsis confragosa; Nectria cinnabarina; Stereum hirsutum; Kretzschmaria deusta; Pleurotus ostreatus; Sarcoscypha austriaca; Auricularia auricula-judae; Coprinellus micaceus; Ganoderma australe; Trametes versicolor; Annulohypoxylon multiforme; Xylaria hypoxylon; Hyphodontia sambuci; Polyporus brumalis; Schizopora paradoxa; Bjerkandera adusta; Rhopographus filicinus; Exidia nucleata; Crepidotus cesatii and Chondrostereum purpurem. 5th February 2017 -Cheadle Heath, Stockport, Cheshire - Puccinia lapsanae was plentiful at the roadside on new Nipplewort foliage. 23rd January 2017 - Marbury CP, Cheshire - A birding venture but 72 species of fungi recorded:- Ganoderma australe; Exidia nucleata; Stereum hirsutum; Rhodocollybia butyracea; Sphaeropsis sapinea; Rhytisma acerinum; Trametes versicolor; Schizophyllum commune; Hypoxylon fragiforme; Chondrostereum purpureum; Trametes gibbosa; Exidia glandulosa; Auricularia auricula-judae; Pleurotus ostreatus; Phlebia radiata; Xylaria longipes; Pluteus cervinus; Mycena tenerrima; Kretzschmaria deusta; Xylaria carpophila; Schizopora paradoxa; Bjerkandera adusta; Puccinia veronicae; Hormotheca robertiani; Tubaria furfuracea; Xylaria hypoxylon; Vuilleminia comedens; Nectria cinnabarina; Annulohypoxylon multiforme; Stereum rugosum; Datronia mollis; Rhopographus filicinus; Flammulina velutipes; Chaetosphaerella phaeostroma; Trichoderma viride; Hyphodontia sambuci; Peniophora quercina; Sarcoscypha austriaca; Lyophyllum decastes; Stereum gausapatum; Dacrymyces stillatus; Sarcomyxa serotina; Fomes fomentarius; Taphrina betulina; Coprinellus micaceus; Piptoporus betulinus; Byssomerulius corium; Daldinia concentrica; Illosporiopsis christiansenii; Diaporthe samaricola; Phoma samararum; Hypholoma fasciculare; Peniophora incarnata; Lycoperdon pyriforme; Diatrype stigma; Nectria episphaeria; Hypoxylon fuscum; Polyporus leptocephalus; Daldinia concentrica; Dendryphion comosum; Phlebia tremellosa; Trochila ilicina; Daedaleopsis confragosa; Cylindrobasidium laeve; Crepidotus cesatii; Phragmidium violaceum; Leptosphaeria doliolum; Calcarisporium arbuscula; Stereum rameale; Mycena filopes, Radulomyces molaris and the myxo Lycogala epidendrum. 16th January 2017 - Gatley Carrs, Stockport, Cheshire - A local walk produced 37 species of fungus, the list was:- Lycoperdon pyriforme; Vuilleminia comedens; Ganoderma australe; Nectria cinnabarina; Cylindrobasidium laeve; Xylaria hypoxylon; Bjerkandera adusta; Sarcoscypha austriaca; Sarcomyxa serotina; Auricularia auricula-judae; Trametes versicolor; Lyophyllum decastes; Byssomerulius corium; Diatrypella quercina; Peniophora quercina; Mycena inclinata; Hypholoma fasciculare; Geastrum triplex; Hyphodontia sambuci; Diaporthe samaricola; Phoma samararum; Taphrina betulina; Chondrostereum purpureum; Sphaeropsis sapinea; Daedaleopsis confragosa; Stereum hirsutum; Exidia nucleata; Trochila ilicina; Rhytisma acerinum; Hymenochaete rubiginosa; Crepidotus cesatii; Lachnum virgineum; Mycena tenerrima; Rutstroemia firma; Coprinellus micaceus; Tremella aurantia and Puccinia lagenophorae. 15th January 2017 - River Mersey, Stockport, Cheshire - Today's walk was cancelled due to crap weather so I took a swift walk down river to stretch the legs. Terana caerulea must be enjoying the climate of late as the original patch has increased and an entire stem is now covered. A marvellous sight! 10th January 2017 - Heaton Moor, Stockport, Cheshire - Back to work for this bugger, 2 fungi seen in the dinner time stroll and both new for the year - these were a healthy looking crop of Hygrocybe reidii and a few clumps of Arrhenia retiruga on garden lawn moss. 8th January 2017 - Tatton Park, Cheshire - A meet-up with some like-minded moochers and a list of fungi kept. According to my calculations a total of 71 species were found, these were:- Trametes versicolor; Stereum hirsutum; Bjerkandera adusta; Ganoderma australe; Pluteus cervinus; Daedaleopsis confragosa; Mycena galericulata; Stereum gausapatum; Calocera pallido-spathulata; Phlebia radiata; Melanotus horizontalis; Exidia glandulosa; Hypoxylon fragiforme; Cylindrobasidium laeve; Vuilleminia comedens; Auricularia auricula-judae; Xylaria hypoxylon; Peniophora quercina; Rhopographus filicinus; Scleroderma citrinum; Piptoporus betulinus; Trichaptum abietinum; Rhodocollybia butyracea; Postia caesia; Clitocybe fragrans; Phlebia tremellosa; Sphaeropsis sapinea; Ganoderma resinaceum; Lycoperdon pyriforme; Coprinellus micaceus; Exidia thurietiana; Diatrypella quercina; Stropharia semiglobata; Polyporus brumalis; Annulohypoxylon multiforme; Hypholoma fasciculare; Stereum rugosum; Heterobasidion annosum; Mycena inclinata; Bulgaria inquinans; Sarcomyxa serotina; Fomes fomentarius; Pleurotus ostreatus; Flammulina velutipes; Resupinatus applicatus; Trichoderma viride; Stereum sanguinolentum; Xylaria carpophila; Taphrina betulina; Exidia nucleata; Belonidium sulphureum; Nectria cinnabarina; Hyphodontia sambuci; Nectria episphaeria; Skeletocutis amorpha; Uromyces viciae-fabae; Kretzschmaria deusta; Mycena tenerrima; Phragmidium violaceum; Leptosphaeria doliolum; Ascorcoryne sarcoides; Crepidotus variabilis; Coniophora puteana; Pezizella alniella; Parasola misera; Scutellinia crinita; Mycena speirea; Mycena filopes; Lachnum virgineum and the myxo Lycogala epidendrum. 7th January 2017 - Fletcher Moss, Didsbury, G. Manchester - A quick morning walk and only a few fungi seen, these were:- Melampsora hypericorum; Flammulina velutipes; Sarcomyxa serotina; Daldinia concentrica; Mycena galericulata; Puccinia caricina var. ribesii-pendulae; Daedaleopsis confragosa; Byssomerulius corium; Piptoporus betulinus; Heterobasidion annosum; Chondrostereum purpureum; Tubaria furfuracea; Trametes versicolor and the myxo Lycogala epidendrum. 6th January 2017 - River Mersey, Stockport, Cheshire - Exidia glandulosa on a dead Oak branch was new for the year. Also Loreleia postii was later identified, growing as expected, on the Liverwort (Marchantia polymorpha). 5th January 2017 - Alexander Park, Stockport, Cheshire - Too frosty for fungi although one wood sculpture of a Fox held 6 fungal species, these were:- Trametes versicolor; Flammulina velutipes; Bjerkandera adusta; Stereum hirsutum; Trametes gibbosa and some old Meripilus giganteus. 4th January 2017 - Cheadle Heath, Stockport, Cheshire - Putting some vegetative waste in the garden and 3 fungi noted for the year:- Terana caerulea; Albugo candida; Xylaria carpophila and Hormotheca robertiani. 4th January 2017 - Bruntwood Park, Stockport, Cheshire - A local walk to pick up some fresh vegetables for tea so why not combine it with a fungal hunt. 28 species today, which were:- Heterobasidion annosum; Mycena inclinata; Tubaria furfuracea; Pleurotus ostreatus; Puccinia caricina var. ribesii-pendulae; Rhytisma acerinum; Trametes versicolor; Chondrostereum purpureum; Pycnostysanus azaleae; Byssomerulius corium; Stereum hirsutum; Trametes gibbosa; Clitocybe geotropa; Ganoderma australe; Xylaria hypoxylon; Sarcomyxa serotina; Hyphodontia sambuci; Gymnopilus penetrans; Nectria cinnabarina; Lycoperdon perlatum; Bjerkandera adusta; Hypoxylon fragiforme; Stereum rugosum; Auricularia auricula-judae; Trochila ilicina; Ascocoryne cylichnium; Crepidotus cesatii and Lachnum virgineum. 3rd January 2017 - Abney Hall, Stockport, Cheshire - I always do an early annual wander at this location and have one eye on the fungi. Today I found 47 species, these were:- Phlebia radiata; Catinella olivacea; Claviceps pupurea; Sarcomyxa serotina; Trametes gibbosa; Taphrina betulina; Pycnostysanus azaleae; Trochila ilicina; Pluteus cervinus; Trichoderma viride; Daldinia concentrica; Tubaria furfuracea; Calyptella capula; Puccinia caricina var. ribesii-pendulae; Rhytisma acerinum; Lycoperdon pyriforme; Hyphodontia sambuci; Heterobasidion annosum; Hypoxylon fragiforme; Nectria cinnabarina; Diatrype stigma; Coprinellus micaceus; Bjerkandera adusta; Ganoderma australe; Daedaleopsis confragosa; Trametes versicolor; Schizophyllum commune; Cylindrobasidium laeve; Schizopora paradoxa; Diatrypella quercina; Peniophora quercina; Vuilleminia comedens; Auricularia auricula-judae; Exidia nucleata; Stereum hirsutum; Kretzschmaria deusta; Xylaria hypoxylon; Stereum rugosum; Leptosphaeria acuta; Calloria neglecta; Phragmidium violaceum; Ascocoryne cylichnium; Mycoacia uda; Crepidotus cesatii; Diaporthe samaricola; Phoma samararum and Dendryphion comosum. 2nd January 2017 - Trentham Gardens, Staffordshire - The frost has hammered the fungi and so, on a birding walk today, we saw very few species. What we did see were:- Tremella foliacea; Rhytisma acerinum; Stereum hirsutum; Trametes gibbosa; Flammulina velutipes; Daedaleopsis confragosa and Daldinia concentrica. 1st January 2017 - Sidings Lane NR, Lancashire - A final walk, this one quite brief but a few more fungi seen:- Piptoporus betulinus; Tubaria furfuracea; Daedaleopsis confragosa; Hyphodontia sambuci; Auricularia auricula-judae; Trametes gibbosa; Hypholoma fasciculare; Flammulina velutipes; Stereum rugosum; Coprinellus micaceus; Rhopographus filicinus; Stereum hirsutum and Trametes versicolor. 1st January 2017 - Mere Sands Wood, Lancashire - Another birding mooch but a few fungi were noted, these were:- Hypoxylon fuscum; Stereum hirsutum; Annulohypoxylon multiforme; Ischnoderma benzoinum; Nectria cinnabarina; Trametes versicolor; Fomes fomentarius; Coprinellus micaceus; Clitocybe nebularis; Exidia thuretiana; Heterobasidion annosum; Hypholoma fasciculare; Chondrostereum purpureum; Bjerkandera adusta; Rhopographus filicinus; Scleroderma citrinum; Taphrina betulina; Baeospora myosura; Crepidotus luteolus; Crepidotus cesatii; Tremella mesenterica and Bulgaria inquinans. 1st January 2017 - Marshside RSPB, Lancashire - A birding jaunt but Coprinopsis atramentaria; Cuphophyllus virgineus and Lycoperdon pyriforme got the fungal year started.